The condition is known to cause symptoms like pain, heat, tingling and numbness to the hand particularly to the first 3 fingers on the radial side. 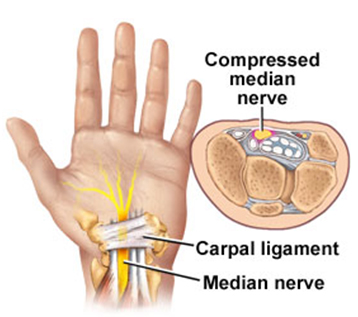 The condition is caused by irritation of the radial nerve passing through the carpal tunnel in between the wrist bones. The problem is often caused by repetitive hand and wrist movement causing tension in the forearm muscles. The treatment involves Dry Needling and massage techniques to release tension in the affected muscles and reduce pain. In addition Myofascial Cupping can be used on the carpal tunnel. But the nerve compression problem sometimes origins from other muscles in shoulder, neck and elbow area or there can be multiple nerve compression areas along the median nerve. Therefore the treatment aims to identify tight muscles and trigger zones in all areas from brain to fingertips. Also part of the treatment is Muscles Energy technique and or postural corrective exercises to realign and reduce tension and compression in shoulder, neck, chest area.